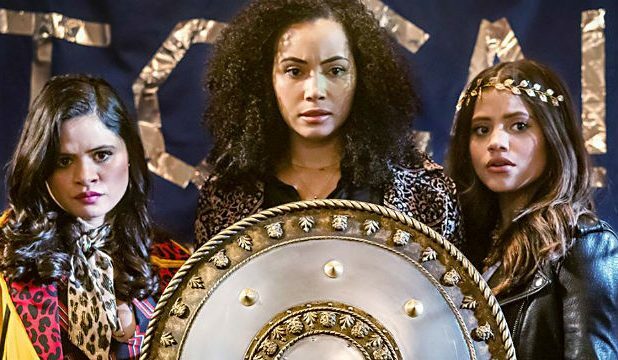 The CW Network’s Charmed reboot series has not even aired its first season finale yet, but the series is already switching showrunners, according to Deadline. Carter Covington (creator of MTV’s Faking It) has left the show for the upcoming second season. In his stead, Liz Kruger and Craig Shapiro, the husband and wife duo will take over. They will seek to take the fledgling show in a different direction creatively. The series stars Melonie Diaz, Madeleine Mantock and Sarah Jeffrey as three supernaturally gifted sisters. It follows a story similar—though not identical—to the original Charmed series that ran on the CW’s predecessor, the WB Network. It starred Alyssa Milano, Holly Marie Combs, Shannen Doherty and later Rose McGowan as the three sisters. Why Covington left the show is unknown. Kruger and Shapiro are fulfilling their overall production deal with the CW Network’s parent company, CBS TV Studios. Their previous credits include CBS’s Extant, which starred Halle Berry and Pierce Gagnon, and Salvation, which starred Santiago Cabrera. Both shows, like Charmed, contained an overt science fiction/fantasy element. The duo also created the USA Network series Necessary Roughness, which starred Callie Thorne, and executive produced Bravo’s Janeane Garofalo-led Girlfriends’ Guide to Divorce. How precisely the series will change with its new showrunners remains to be seen. It appears to be the only personnel change at this time. Unless further changes take place, Charmed will keep its main cast. Its executive producers will also stay the same. The series is executive produced by Jennie Snyder Urman, Amy Rardin, Jessica O’Toole, Brad Silberling and Ben Silverman, all of whom worked on the CW’s cult hit Jane the Virgin. Jane the Virgin stars Gina Rodriguez and is about to start its fifth and final season. A spin-off series is in the works.